PamFax 2.0: Where Do They Get All Those Numbers? Signing up for a one year subscription to acquire a fax-in number is about a five minute process when you subscribe to PamFax Professional. What makes it possible to so easily obtain a “local” number in any of over one hundred cities in 27 countries? Short answer: Voxbone. I first learned about Voxbone’s services when they were a major sponsor of eComm 2008 a year ago March. At the time CEO Rod Ullens told us how Voxbone was able to provision DID numbers in over 4000 cities in 47 countries worldwide at minimum cost. Last fall Voxbone launched their iNum service which creates “universal worldwide ‘local’ numbers” via the +883 country code. Customers for their basic DID services, who have been covered on Voice On The Web, include iSkoot, Calliflower, Mobivox,Truphone, OnState, Evoca and Voxeo. An API for the automated delivery of these faxes to any software or Web site. In other words, Voxbone is equipped not simply to “make the connections” involved in receiving a fax but also to ensure that formatting and delivery automation is appropriately handled when receiving a fax via PamFax. Bottom line: Through Voxbone, documents faxed to PamFax Fax-In customers are delivered as PDF files which can then be printed, sent as email attachments, archived or otherwise viewed and transferred at the recipient’s discretion. 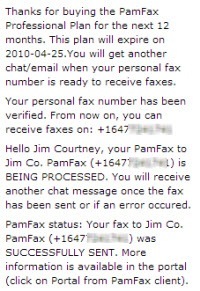 4 Responses to PamFax 2.0: Where Do They Get All Those Numbers? Jim, this is really interesting. I'm curious, does Voxbone still partner with other faxing companies or are they now exclusive partners with PamFax? I don't believe there is any reason for PamFax's relationship with Voxbone to be exclusive but one would have to inquire with Voxbone, if there is interest in using their services for another fax service.